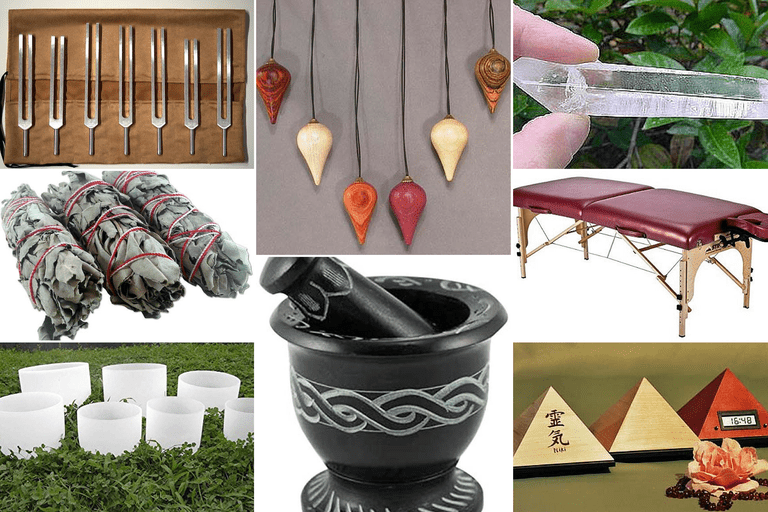 Below are some common tools that massage therapists, energy medicine practitioners, Native American medicine healers, and other holistic healers utilize to help facilitate healing and promote balance/wellness while working with their clients. Donna Eden's Energy Medicine Kit is an inexpensive set that includes DVD showing Donna working with energy during her seminars, instruction booklet, exercise CD, glass crystal pendulum, plus beautifully illustrated flash cards that demonstrate the most important techniques. Natural crystal wands are used during massage and reflexology sessions. The rounded end is used as a stroking tool using varying pressures directly on the body. The pointed end is used to channel energy in the auric field. Using a smudging tool is part of many Native American traditions. The burning of herbs for emotional, psychic, and spiritual purification is also common practice among many religious, healing, and spiritual groups. A healer will often smudge his healing space before and after treating clients. Primarily grown in California, White Sage (commonly called "Sacred Sage"), is considered the purest of all medicinal sage plant varieties. Best used as a smudging tool in purification ceremonies. The Chinese "Lo Pan" (Feng Shui Compass) is used to find the best chi locations for interior decorating and exterior architectural design. Sweetgrass braids are burnt during prayer ceremonies, its sweet aroma is said to attract "good spirits." These stones are not a typical tool used by Reiki practitioners. However, I really like this set of four stones. Reiki symbols are used to increase energy and to help direct the flow of chi. The four Reiki symbols depicted on these stones are the Master Symbol, Power Symbol, Harmony Symbol, and the Connection Symbol. Smooth and flat stones are used in Hot Stone Therapy. Heated stones are placed at specific sites on the client's body to promote relaxation and to help open up the meridians (energy pathways). Massage oils are also usually incorporated into the massage treatment. Pendulums are used for reading imbalances in the human energy field, especially the chakras. Wooden Pendulums are recommended over those made of crystal or metal pendulums because wood posseses subtle energies in comparison to the energies housed in metals and crystals. The more highly energy-charged the pendulum the more difficult to get a clear reading with. This is especially true if the pendulum has not been cleared properly. Mortar and Pestle is that traditional tool used for grinding up medicinal and culinary herbs, incense, etc. The Reiki practitioner can program this special timer to chime at preset intervals. There are eight possible settings every 2, 2 ½ , 3, 4, 5, 10, 15 or 20 minutes for up to 90 minutes. Chimes can serve as a reminder to switch Reiki hand-placements during a healing session. The timer's quiet sounding signal be used by any type of therapist or healer to help regulate their sessions without having to watchful of a clock. Tuning forks are not just for science or music. The resonant tones of these simple instruments can be used for healing. Sacred sounds. These musical bowls create different tones depending on the level of water placed inside the bowl. Certain tones invoke certain energy centers (chakras) for healing, balancing, and meditation. Feathers are used in moving incense or smuged smoke during healing ceremonies or rituals. The fans or whisks can also be used in clearing away stagnant or negative energies before and after healing treatments. Stronglite portable massage tables are very durable and reasonably easy to carry from place to place. I special ordered The Classic model for extra width and additional padding. It serves my needs perfectly in my Reiki business. An aromatherapy diffuser is used to disperse essential oils into the healer's work space. This model is appropriate to quickly diffuse essential oils for aromatherapy applications. Acupuncture pressure points and meridians are marked on teaching models of the human anatomy. Ear Candling (also called Ear Coning) is an ancient healing method originating in Egypt still in use today at alternative medicine clinics and holistic centers. Ear candles can be purchased at metaphysical stores, holistic health markets and online shops. Reflexology chart featuring the associations and basic information of reflex points and corresponding organs on your feet. Crystal points can be utilized in healing for cutting through the energy field during psychic surgery. The wands can also be used for directing a pathway for healing energies to flow inward or negative energies to flow outward. Exactly How Does Visualization Help Foster Healing?